I am going to get straight to the point. I’ve been looking forward to Ocean’s 8 for a very long time. Since seeing a preview of it in Total Film magazine featuring a widespread page with the cast on a subway train, I have been psyched to watch it. I must confess that I haven’t seen all the previous Ocean’s movies all the way through, because 2001 was ages ago and George Clooney looks so young it confuses me. But I digress. Like the “reboot” of Ghost Busters (2016) , the all female cast is what interested me. With some of my favourite actresses like Sandra Bullock and Helena Bonham Carter, and my new found love for Cate Blanchett since Thor Ragnarok (2017), how on earth could this movie be bad? Ocean’s 8 follows Debbie Ocean (Sandra Bullock) and her partner, Lou (Cate Blanchett) as they conspire and attempt to rob a super fancy and expensive necklace from the Met Gala. To be honest, that is all there really is to the plot, but every review I have read likes to state that it took Debbie “five years, eight months and 12 days” to come up with the plan, and so, I thought I would add that in too. 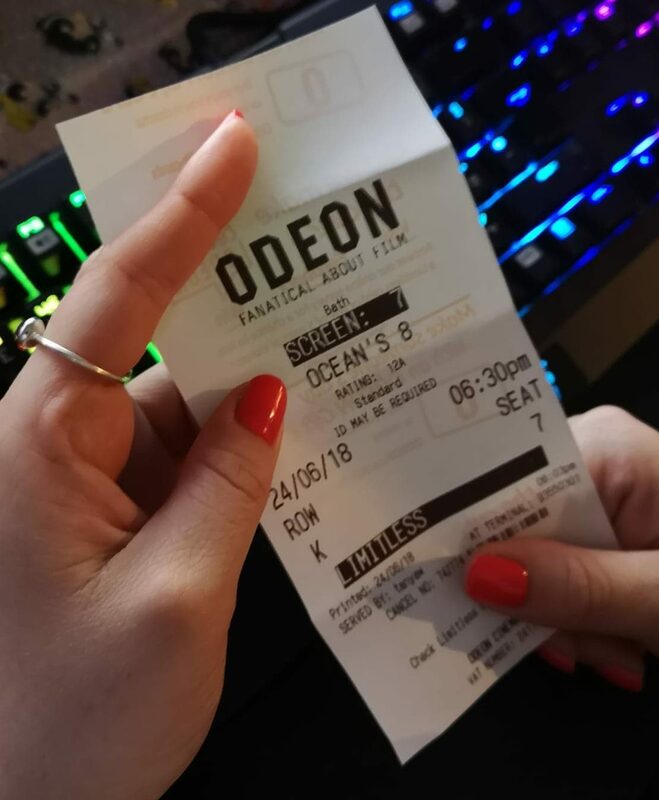 I thoroughly enjoyed Ocean’s 8. (I would have enjoyed it more if I didn’t need to pee halfway through, but hey, it’s an imperfect world.) Both Empire and Total Film seem to have nailed it with their reviews. The film follows a very similar story to Ocean’s 11— which I watched earlier today. For instance, both 11 and 8 start with a parole hearing, both Danny and Debbie did 5 years in the slammer, both have a partner in crime and both leave jail and more or less instantly go back into a life of crime… and some people say that the prison system doesn’t work huh? I guess the big difference is that Brad Pitt isn’t in this one eating something during every shot. By god, does that man eat a lot in Ocean’s 11! That doesn’t go to say that Ocean’s 8 is a carbon copy of Ocean’s 11, because that is not true at all. Sandra Bullock sums up the film perfectly stating that “we’re not a reboot… it’s not even a passing of the torch. It’s a parallel story of another family member that was raised in the same family as Danny Ocean was.” Furthermore, the story is a lot tighter. The plot gets to where it’s going a lot faster and all of the other team members personalities are stronger than 11. Other than sulking and eating, I honestly know nothing about Brad Pitts character… not even his name. Comparisons aside, Ocean’s 8 has a nice balance of humour, action and tension. But it’s the cast which really makes the film special. Personally, I really liked Daphne Kluger, played by Anne Hathaway. The trailers made her out to be a massive air head, but her character is actually quite complex. The dynamic between Bullock and Blanchett is perfect. #Bants. After Valerian and the City of a Thousand Planets (2017) I thought I would never say it, but Rhianna is awesome. Oh and James Corden is in it, need I say more? Previous Post:5 LONG YEARS. STILL NO NEW AC TITLE. HOW COME NINTENDO?